At the Law Offices of David Azizi, we understand the difficulties of paying for a law school education. Having solid ambition and a dedicated work ethic are indeed necessary and core traits. For many, getting the scholarship funds to help them on that journey becomes essential. To that end, David Azizi is providing a scholarship for students currently enrolled in accredited Law Schools throughout the state of California. Personal injury attorney David Azizi understands what it takes to make it through law school. As a student, David received a small scholarship during his time at Southwestern Law School in Los Angeles, and still refers to it as, “amazingly helpful.” For more than 20 years, David has practiced personal injury law in Los Angeles, Beverly Hills and Riverside, and now offers this scholarship as a way to pay forward the help he received back then to students today. $2,000 to one chosen student. You can easily apply for the scholarship below. This $2,000 California law school scholarship can be used for law school tuition or for any need that comes up during your law school experience. David knows and understands the difficulties of making ends meet when attending law school. 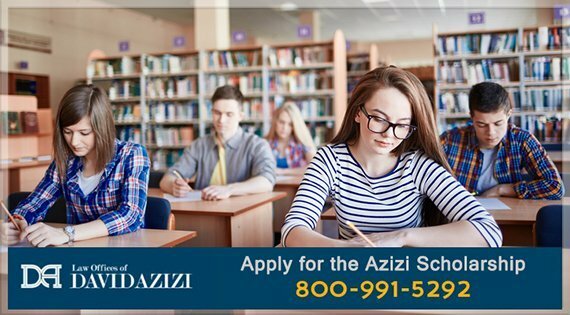 If you are a currently enrolled student at an accredited California law school, the David Azizi California Scholarship is available to you. One winner will be selected by David Azizi to receive the $2,000 scholarship award based upon an essay submission. Why are you choosing to attend law school? What interests you about personal injury law? Pick a case or incident within personal injury law and discuss a situation where negligence, resulting in injury, triggers a personal injury claim. The $2,000 scholarship award will be based on the essay. Important: Please be sure to make all content in the essay original work. The deadline for applying is August 1, 2018. The scholarship will be awarded before the fall semester each year. David believes that education, knowledge and understanding guide clients through the difficult times of injury and upheaval in their lives. Strong essays will provide a teaching experience that readers can learn from.